This past Sunday I had the pleasure to meet with Fiona Krüger and her husband to talk watches and learn more about her brand, Fiona Krüger Timepieces (also on Instagram). Fiona is currently on a business trip, stopping by Los Angeles and Mexico to meet up with customers, watch aficionados, and different retailers. If you do not know her by name, you are sure to have seen one of her watches before. Fiona is the designer of the limited SKULL and BLACK SKULL watches. Inspired by the Mexican "Dia de los Muertos" (Day of the Dead) celebration and its famous skull image, Fiona's first two watches are bold and unique. The polished stainless steel (with PVD treatment on the BLACK SKULL model) watch case measures 57.4mm x 41.3mm and it is 10.3mm thick. 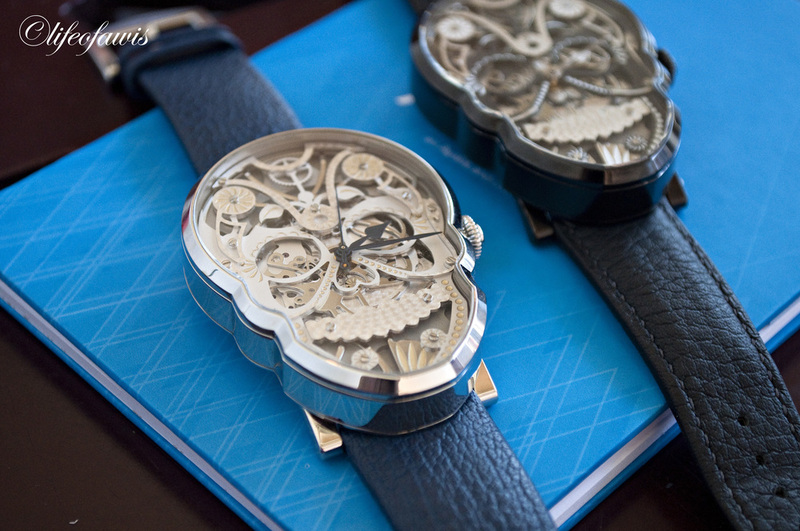 Though this is not the first time the skull has been used as an inspiration for the design of a watch, I believe no other brand has ever created a watch case that is actually shaped as one. At first sight the watch looks huge. 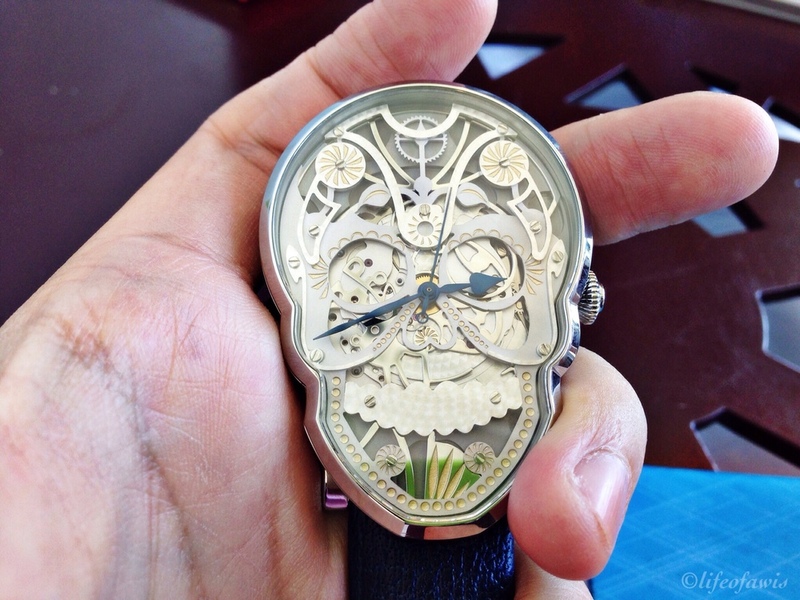 But once on the wrist, it actually looks moderately sized and it is also surprisingly comfortable (mainly due to the small curved lugs behind the skull case). The top half of the crown is partially covered by the shape of the case, which could make pulling the crown out to adjust the time a bit difficult. The watch also features a three layer skeleton dial with different kinds of finishing to create contrast and dimension. 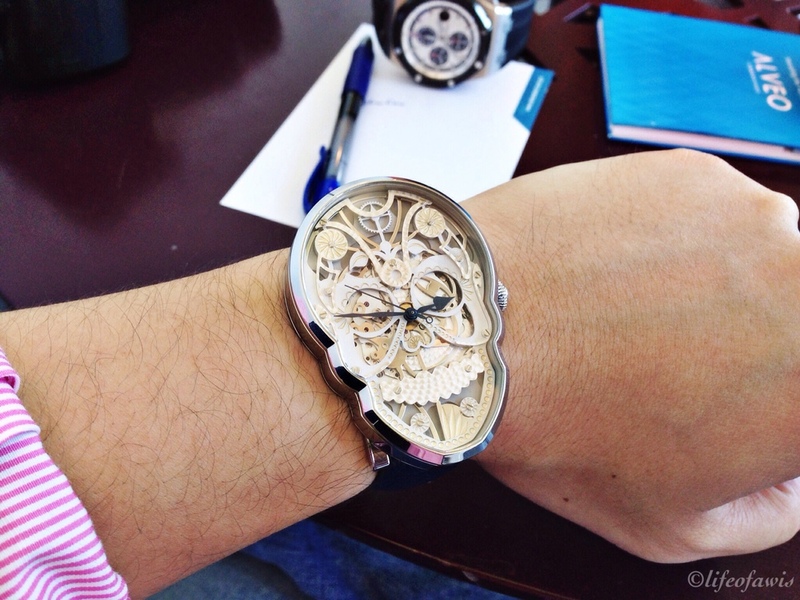 The dial is an absolute treat to look at, it is extremely intricate and the attention to detail is undeniable. On the stainless steel model, the hands can be easily identified thanks to the blue galvanized brass hands, but there is no lume for night time use. On the other hand, the PVD model has silver hands with lume, which makes it slightly hard to read time during the day, but more useful at night (ironic right?). In addition to the lume on the hands, parts of the design on the dial also has lume, making it a beautiful glowing art during the night. Another major difference on the PVD model is that one of the layers on the dial is black. Not only does it match the PVD case better, but it also gives the dial an extra pop. Powering this beast is a manual wind, Technotime Swiss movement with a commendable 5-day power reserve. All components are from Switzerland. The case work, decoration, and assembly are also completed in Switzerland. The SKULL with blue galvanized brass hands. Wrist shot of the SKULL. The closed case back has a vertical brushed finish with an interesting yet appropriate engraving, "Memento morieris" (Remember death). From the image below, you can see the small curved lugs that help make this watch so comfortable to wear. Above all, Fiona is a designer at her core. She has a Masters in Advanced Studies in Design for the Luxury Industry from ECAL in Switzerland. By looking at her watches one can immediately recognize that a strong emphasis has been placed in the design aspect. As she explained herself, she wanted to design a watch based on what she liked. One of her biggest pet peeves is how the watch industry seems to think that women only care for diamonds and mother-of-pearl dials. She has definitely proved them wrong with her SKULL watches. When asked what other watches she would wear outside of her own brand, she said there were three at the moment: Audemars Piguet Royal Oak, Speake-Marin, and any MB&F. 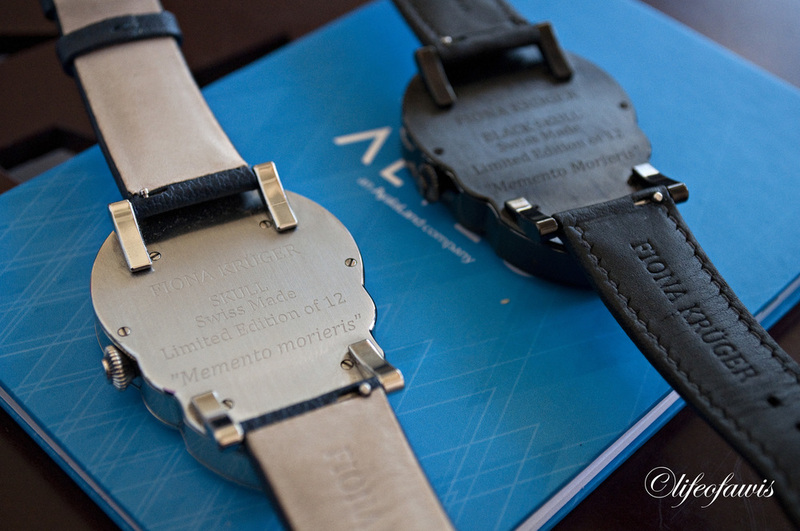 Fiona not only has a strong design background, she also has excellent taste when it comes to watches. My favorite part about this brand is how it breaks all the norms that we are used to... a skull watch that was designed by a woman... yes, really. This alone deserves high praise. Kudos to Fiona for staying true to herself and to her designs. The exotic design of the watch and price of approximately $16,000 is definitely not for everyone. But for the watch lover looking for something exclusive, extremely unique, and just freaking cool, this watch will not disappoint. It seriously does not get more unique than this. 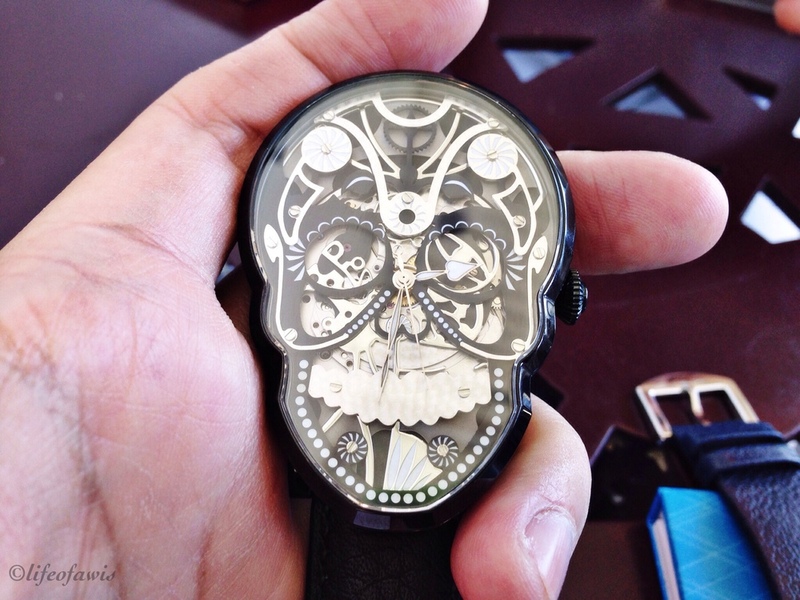 More than a watch, the SKULL and BLACK SKULL timepieces are in the purest sense, works of art on the wrist. Expect a more sophisticated and complex skull watch in the near future as Fiona continues to expand her SKULL collection. Stay tuned. The SKULL timepieces with my Audemars Piguet.